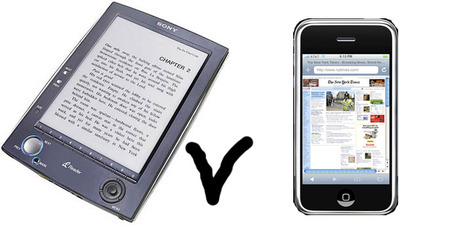 Is the iPhone the ultimate ereader? Yesterday I downloaded Kobo, the hot new ebook app which works on just about every mobile and every PC, to my iPhone. I then sat down on the bus grabbed a freebie copy of Gogol’s 19th century masterpiece Dead Souls and started reading. To be honest I didn’t actually get past the introduction. My phone rang and when I got back to the book I had lost the will to live. Even after a few pages my eyes felt heavy and I got annoyed by constantly flicking the screen (admittedly you can scroll down website style if you prefer). So while I love the fact that a huge selection of the greatest novels ever written are one click away (and free to boot), I know I’ll never get through more than a chapter of each one. In some respects the iPhone should be the perfect ereader (and there are lots of companies who have ebook software for the device) but for me at least it just doesn’t work. The screen is too small, the battery life too short and it just isn’t comfortable enough. Anyhow good luck to Kobo, there’s nothing wrong with their iPhone app and the library of free books is terrific. But I can’t imagine I’ll be using it very often.